Recently I found myself in the Ice Cream Mama branch in Shatti at the request of their management to come and check out their ice cream. To be honest I was putting it off because I just assumed it was "another Baskin Robbins" and didn't really think it would be very good. I am very pleased to share that I was totally surprised with what they had to show me. I could talk about the decor of their store (its all graffiti) but that's not really me. I had wrongly assumed that Ice Cream Mama was just another ice cream place where you bought it by the scoop. But Ice Cream Mama is not like that - they have their own unique, Omani set of flavours, and the way they present their ice cream is unique - it's in pre-made portions that you buy. The best bit? The price ranges between 350bz and 700bz depending on what you get. I was invited to try any I wanted, but I'm on a very strict diet and exercise regime (part of research for an upcoming blog post about a gym) so I declined - but after excessive pressing I opted to try one called Luban Omani - a traditional flavour I was told. I only had a few licks before I binned the tasty treat because of my diet but I was impressed - I'll be taking my eldest kid to Ice Cream Mama next time we're in MGM for the play-area next to the cinema. Mostly because the ice cream was so tasty, but also because the portions are limited and thus it restricts the amount of mess (and ice cream) my terror chop kid can create/eat/smear into artistic stains on everything she can get her hands on. Some of the rarer flavours they offer are: Omani Halwa, Laban, Vimto, Marshmallow, Tang, Vimto, Dates, Karak Tea... and then there are the usual sweet-tooth favorites like Caramel, Chocolate, Nutella, Snickers, Oreo and KitKat... and there's a lot more than those too! 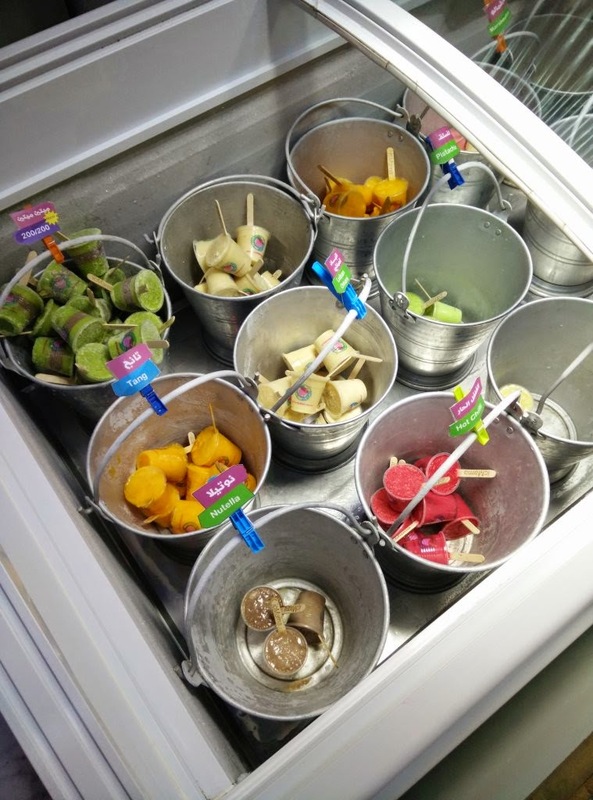 Now it turns out that Ice Cream Mama is a home-grown Omani brand that started out in 2012 when Rami and Huda Al Lawati used Rami's mothers' secret ice cream recipe that had it's roots dating back to the 1950's, when Ice Cream in Oman was made in 2 original flavours! 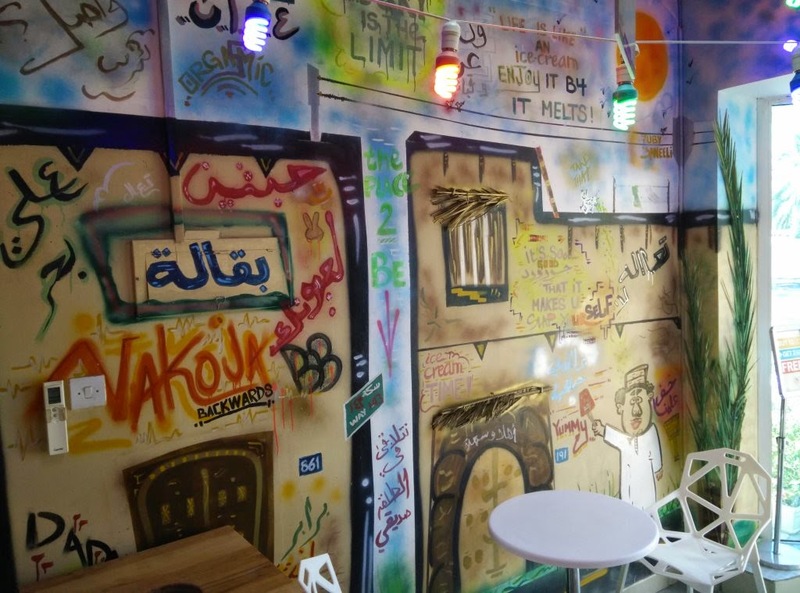 Today, the couple have grown their business to include 4 locations; Shatti City Cinema, Ruwi City Cinema, Muscat Grand Mall and Mawaleh. 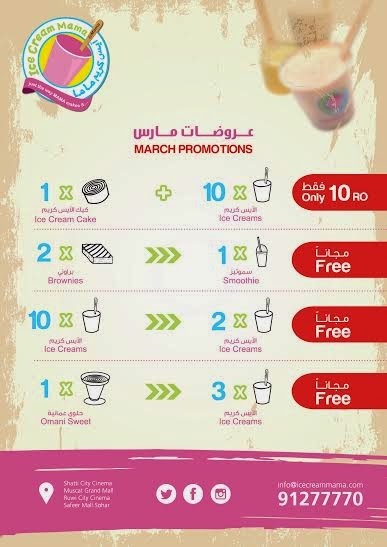 And as it happens, they are having a March promotion for their Ice Cream and other products (very nice looking cakes, Omani Sweets and smoothies). Honestly, if you're looking for ice cream, next time if you see Ice Cream Mama (and like me just ignored it because I was ignorant of their products) go and at least try it - 350bz isn't a lot and you'll get to enjoy something familiar yet truly different. Ice Cream Mama is active on Social Media: Instagram, Twitter, Facebook. Everything looked great .I like the cut out where did you get it from?